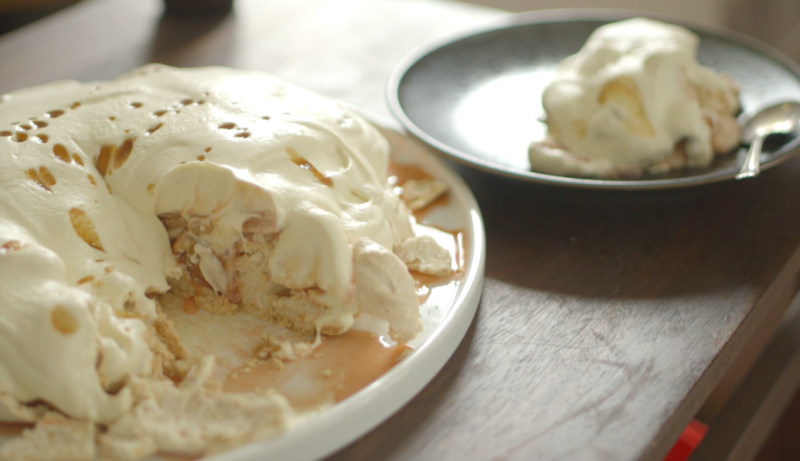 Hakanoa Ginger Syrup in the pavlova mixture and whipped cream add toasty rich butterscotch flavours to our favourite dessert, perfectly balanced by tangy lightly spiced rhubarb compote. The Pavlova recipe is a slight variation on Alexa Johnston’s excellent recipe from her cookbook ‘Ladies, A Plate’. A book every household should own. 5 or so stalks of rhubarb, washed trimmed and sliced into 2 cm lengths. – toss together in shallow glass or ceramic baking dish, cover with lid or tinfoil and put into the lower part of the oven. Bake for 30 to 45 minutes, until the rhubarb is very soft to the touch. Allow to cool. Beat the egg whites with a pinch of salt in a large well-cleaned bowl. Beat until the whites make soft peaks. Then add the caster a sugar a sprinkle at a time beating well between additions. The mixture should become a glossy satin texture and the peaks should be firm. Sprinkle the vanilla and vinegar and the Hakanoa Ginger Syrup over the mixture, then sift the cornflour over everything. Fold these gently into the meringue mixture with a large metal spoon. Line a baking tray with baking paper. Mark a circle on the reverse side of the paper (you don’t want pencil marks on your pavlova) that’s slightly smaller than you want the end result to be. Use a rubber spatula to scoop the mixture onto the paper and shape into a roughly flat topped circle. A few peaks around the edge and dips toward the middle make useful fencing for the whipped cream later on. Put the pavlova into the middle of the oven, and bake for 45 minutes. Then turn the oven off and leave it in there just sitting for at least 1 hour or overnight. Beat together until the cream is nicely whipped. When the Pavlova has cooled, gently peel the paper off the bottom and place the beauty on your serving dish. Heap the ginger cream all over the top, trying not to let it spill down the sides. Take the cover off the Rhubarb and Ginger compote and spoon all the soft fruit and juices evenly over the cream. Allow to sit for 1 hour before serving, to allow the flavours to meld and the cream to soften the Pavlova. Download a printable version of this recipe.